Our action range practice area is located just to the right of the entrance to the rifle range. 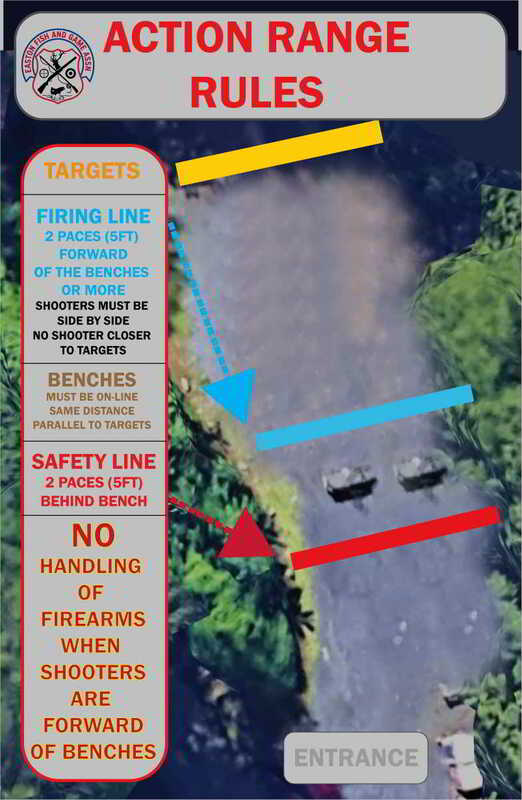 The purpose for this area is for members to perform defensive-carry draw and fire practice. All members are welcome to use the action range training area when an organized event or special instructor led class is not using the range. All shooting events and special instructor led training that occupies the action range training area for a block of time is pre-approved by the Training, Education and Programs committee. The action range can accomodate pistol, pistol-caliber carbines and shotguns. For safety reasons rifle calibers (.223/5.56, 7.62x39, .308, etc) and shotgun slugs are prohibited on this range, as debris from the impact area has a tendancy to fly over to the shooting positions for the rifle range. Shotguns may only be shot towards the berm, we do not allow any type of arial shooting. Anyone not shooting must be five (5) feet behind the benches when anyone is forward of the benches. Firearms may not be handled when anyone is forward of the benches. Magazines can be loaded, but you must do so five (5) feet behind the benches.